Hot chocolate splashed at my feet. Strollers weaved through the crowd. The anticipation was building. Toddlers on shoulders, kids on tiptoes - all trying to get a glimpse; then bam! 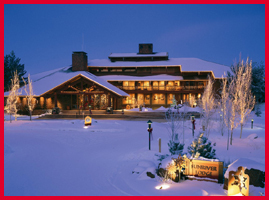 The lights went on and the Sunriver Lodge was aglow in holiday cheer. Sunriver Resort's Grand Illumination kicks off the holiday season with the grand entrance of Santa's sleigh, complete with Santa and his elves, Frosty the Snowman, the Gingerbread Man, plus an impressive collection of local carolers and musicians. With a courtyard packed to capacity, locals and visitors mingled into the night - an impressive kickoff of the holiday season. Oregon is big on family tradition and Sunriver Resort is no exception. Sunriver Resort is all about family. Retro by design, their holiday celebration, "Traditions", is packed full of holiday events for kids of all ages. Designed to incorporate traditional family activities into the family vacation, Traditions blends special events like the Teddy Bear Tea with traditional family time like Yuletide Board Games. Designed to bring generations together, the program is packed full of festivity and fun - resulting in a bit of traditional cheer that can get overshadowed in our fast paced gadgetized world. Sunriver Resort is a beautiful compound - mini city actually - that is 15 miles south of Bend, Oregon. With easy access to Bend and Mt. Bachelor, it is the perfect place to park it for a week of snow adventure. Factor in all of the on-site activities like ice-skating, sleigh rides, swimming pool, spa facilities and shopping, and the resort experience is more than complete. Traditions attracts families - kids, teens, toddlers, grandparents - like no other program I've ever seen. Family photos overlooking the meadow, feasts in the Great Hall, families gathered around the Christmas tree - so Norman Rockwell it was scary. The return to family values is alive and well at Sunriver Resort. Skiing: Mt. Bachelor, just 15 miles up the road, offers tubing, skiing/riding, and cross country skiing. With an early ski season, 2005 has been good to Mt. Bachelor. We caught some incredible powder and excellent coverage. A bonus? Guests who stay at Sunriver Resort from Nov. 1-Dec. 16 get a Kids-Ski-Free ticket to Mt. Bachelor when buying one adult lift ticket. Shopping: The Sunriver Village offers a variety of shops, plus the Merchant Trader Mercantile in the lodge is well stocked. Gingerbread Junction: Stroll through the North Pole to get a glimpse of locally made gingerbread houses. Plus you can decorate your own gingerbread cookie. Fun stuff. Fort Funnigan: More than daycare, this program for kids ages 3-10 incorporates special themed programs like Weird and Wacky Science and Safari Expedition. Best part? The program is available on some evenings so you can actually have a special gourmet dinner with your significant other - alone! Stuff-Your-Own-Bear Workshop: Work it into your schedule - there's nothing like a keepsake bear to keep your fun button energized. Sleigh Rides: Sun or snow - the sleigh shall go. Snuggle under a blanket and go dashing through the snow. They'll remember this one forever. Teddy Bear Tea: Bring back the tradition - with your own teddy. Santa Sightings: Breakfast with Santa, photos with Santa - make your list! Elf Tuck-Ins: An elf actually visits your room for a special tuck-in complete with a story. Incredible! Ski Movies: Warren Miller's "Higher Ground" - shown in the Great Hall. Who doesn't like Warren Miller movies? Bond with the teens on this one. Sugar Plum Storytellers: Children gather at the North Pole for a special treat where sugarplums can dance through their heads. Holiday Jazz, Choraleers, Bells of Sunriver: Music in the mountains - holiday sounds that will lodge in your head. Are you humming? Bonfire in the Snow: Snowshoe through the snowy forest to this bonfire - complete with dessert and hot drinks. A great activity for all ages - snowshoeing is easy to learn and invigorating! Sunriver Resort offers a variety of lodging options. The lodge has 209 guest rooms and suites - with fireplaces and private decks. There are over 280 private homes and condominiums as well. We loved the privacy of a condo, but enjoyed all the amenities that the lodge offered. Dining in for breakfast, packing a picnic lunch, and then exploring the restaurants is an affordable way to go. There's no doubt that a visit to Sunriver Resort will bring home some tradition to your family. Ask about the Traditions package when booking. Call 800-547-3922 or visit their website Sunriver-Resort.com.